Spain has its own classifications of accommodation types partly for historical reasons; long before ‘tourism’ as such Spain was a country that very much lived on the move – as indeed it still does! Hotels cater for luxury whereas hostals are more for transient workers – but are none the worse for that! One of the ‘great unknowns’ to foreign tourists is the sector that caters more for the Spanish themselves. This is partly about geography; most Spanish people live in cities and regard boiling hot Mediterranean beaches as a version of Hell-on-Earth. They prefer to escape – the wonderful term is desconectarse meaning literally ‘to disconnect oneself’ – to cooler and quieter regions in the mountains or the beautiful north coast – but note they also go to the Med. in the off-season when it’s cheaper! The latest manifestation of the Spanish need to get away from it all is turismo rural, based mostly on farmhouse accommodation. This offers not only good value but a chance to experience ‘real’ Spain. Furthermore, these are often in areas of outstanding beauty that don’t have alternative facilities – so no caravans, no Sunday drivers . . . 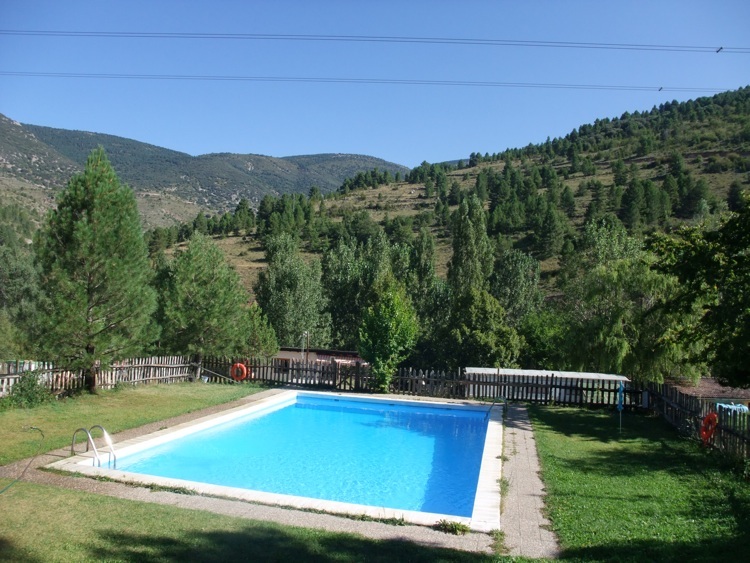 Pool with a view: you don’t always find pools like this on the Internet – the camp site at Moli de Fornols is too small to pop-up on Google but it’s a gem – one of my favourite overnight stops, complete with an excellent restaurant! A final point is about finding all this: the Internet has transformed the roaming biker’s ability to seek and find great digs. But although Spain has taken on the new technology hook-line-and-sinker there is much out there that hasn’t – using a site like booking.com is very good and easy, but this isn’t the whole picture by far. Don’t forget to check out tourist offices on the ground – they’re there to help and really do know the best places to visit, sleep, eat, etc. But one important thing to bear in mind is that most are run by the local town or city council, the ajuntamiento, and thus won’t know information that is off of their patch. This can be frustrating if you don’t know where the boundaries are – but persevere, local tourist offices really are the best source of quality information! Worried about the Laws in Spain? Ask the Guardia Civil! Make a difference: support cancer research! I'm helping Graham Lampkin with his sponsored bike run through Spain on a Classic Royal Enfield - all for Cancer Research! All material in this web page is subject to copyright: © 2019 Simon Rice.